AppleTalk is a discontinued proprietary suite of networking protocols developed by Apple Inc. for their Macintosh computers. AppleTalk includes a number of features that allow local area networks to be connected with no prior setup or the need for a centralized router or server of any sort. Connected AppleTalk-equipped systems automatically assign addresses, update the distributed namespace, and configure any required inter-networking routing. AppleTalk was released in 1985, and was the primary protocol used by Apple devices through the 1980s and 1990s. Versions were also released for the IBM PC and compatibles and the Apple IIGS. AppleTalk support was also available in most networked printers (especially laser printers), some file servers, and a number of routers. The rise of TCP/IP during the 1990s led to a reimplementation of most of these types of support on that protocol, and AppleTalk became unsupported as of the release of Mac OS X v10.6 in 2009. Many of AppleTalk's more advanced autoconfiguration features have since been introduced in Bonjour, while Universal Plug and Play serves similar needs. After the release of the Apple Lisa computer in January 1983, Apple invested considerable effort in the development of a local area networking (LAN) system for the machines. Known as AppleNet, it was based on the seminal Xerox XNS protocol stack but running on a custom 1 Mbit/s coaxial cable system rather than Xerox's 2.94 Mbit/s Ethernet. AppleNet was announced early in 1983 with a fall introduction at the target price of $500 for plug-in AppleNet cards for the Lisa and the Apple II. At that time, early LAN systems were just coming to market, including Ethernet, Token Ring and ARCNET. This was a topic of major commercial effort at the time, dominating shows like the National Computer Conference (NCC) in Anaheim in May 1983. All of the systems were jockeying for position in the market, but even at this time Ethernet's widespread acceptance suggested it was to become a de facto standard. It was at this show that Steve Jobs asked Gursharan Sidhu a seemingly innocuous question, "Why has networking not caught on?" Four months later, in October, AppleNet was cancelled. At the time, they announced that "Apple realized that it's not in the business to create a networking system. We built and used AppleNet in-house, but we realized that if we had shipped it, we would have seen new standards coming up." In January, Jobs announced that they would instead be supporting IBM's Token Ring, which he expected to come out in a "few months". Through this period, Apple was deep in development of the Macintosh computer. During development, engineers had made the decision to use the Zilog 8530 serial controller chip (SCC) instead of the lower-cost and more common UART to provide serial port connections. The SCC cost about $5 more than a UART, but offered much higher speeds of up to 250 kilobits per second (or higher with additional hardware) and internally supported a number of basic networking-like protocols like IBM's Bisync. The SCC was chosen because it would allow multiple devices to be attached to the port. Peripherals equipped with similar SCCs could communicate using the built-in protocols, interleaving their data with other peripherals on the same bus. This would eliminate the need for more ports on the back of the machine, and allowed for the elimination of expansion slots for supporting more complex devices. The initial concept was known as AppleBus, envisioning a system controlled by the host Macintosh polling "dumb" devices in a fashion similar to the modern Universal Serial Bus. The Macintosh team had already begun work on what would become the LaserWriter, and had considered a number of other options to answer the question of how to share these expensive machines and other resources. A series of memos from Bob Belleville clarified these concepts, outlining the Mac, LaserWriter and a file server system which would become the Macintosh Office. By late 1983 it was clear that IBM's Token Ring would not be ready in time for the launch of the Mac, and might miss the launch of these other products as well. In the end, Token Ring would not ship until October 1985. Jobs' earlier question to Sidhu had already sparked a number of ideas. When AppleNet was cancelled in October, Sidhu led an effort to develop a new networking system based on the AppleBus hardware. This new system would not have to conform to any existing preconceptions, and was designed to be worthy of the Mac – a system that was user-installable, had zero-configuration, and no fixed network addresses – in short, a true plug-and-play network. [third-party source needed] Considerable effort was needed, but by the time the Mac was released, the basic concepts had been outlined, and some of the low-level protocols were on their way to completion. Sidhu mentioned the work to Belleville only two hours after the Mac was announced. The "new" AppleBus was announced in early 1984,[N 1] allowing direct connection from the Mac or Lisa through a small box that plugged into the serial port and connected via cables to the next computer upstream and downstream. Adaptors for Apple II and Apple III were also announced. Apple also announced that AppleBus networks could be attached to, and would appear to be a single node within, a Token Ring system. Details of how this would work were sketchy. Just prior to its release in early 1985, AppleBus was renamed AppleTalk. The system had a number of limitations, including a speed of only 230.4 kbit/s, a maximum distance of 1000 feet from end to end, and only 32 nodes per LAN. But as the basic hardware was built into the Mac, adding nodes only cost about $50 for the adaptor box. In comparison, Ethernet or Token Ring cards cost hundreds or thousands of dollars. Additionally, the entire networking stack required only about 6 kB of RAM, allowing it to run on any Mac. The relatively slow speed of AppleTalk allowed further reductions in cost. Instead of using RS-422's balanced transmit and receive circuits, the AppleTalk Personal Network cabling used a single common electrical ground, which limited speeds to about 500 kbit/s, but allowed one conductor to be removed. This meant that common three-conductor cables could be used for wiring. Additionally, the adaptors were designed to be "self-terminating", meaning that nodes at the end of the network could simply leave their last connector unconnected. There was no need for the wires to be connected back together into a loop, nor the need for hubs or other devices. The system was designed for future expansion; the addressing system allowed for expansion to 255 nodes in a LAN (although only 32 could be used at that time), and by using "bridges" (which came to be known as "routers", although technically not the same) one could interconnect LANs into larger collections. "Zones" allowed devices to be addressed within a bridge-connected internet. Additionally, AppleTalk was designed from the start to allow use with any potential underlying physical link. The main advantage of AppleTalk was that it was completely maintenance-free. To join a device to a network, you simply plugged the adaptor into the machine, then connected a cable from it to any free port on any other adaptor. AppleTalk's internal protocols negotiated a working network address number, automatically gave the computer a human-readable name, and collected up a list of the names and types of other machines on the network so the user could browse the devices through the GUI-based Chooser. AppleTalk was so easy to use that ad-hoc networks tended to appear whenever multiple Macs were in the same room. Apple would later use this in an advertisement showing a network being created between two seats in an airplane. A thriving 3rd party market for AppleTalk devices developed over the next few years. One particularly notable example was an alternate adaptor designed by BMUG and commercialized by Farallon as PhoneNet in 1987. This was essentially a replacement for Apple's connector that had conventional phone jacks instead of Apple's round connectors. PhoneNet allowed AppleTalk networks to be connected together using normal telephone wires, and with very little extra work, could run analog phones and AppleTalk on a single four-conductor phone cable. Other companies took advantage of the SCC's ability to read external clocks in order to support higher transmission speeds, up to 1 Mbit/s. In these systems the external adaptor also included its own clock, and used that to signal the SCC's clock input pins. The best known such system was Centram's FlashTalk, which ran at 768 kbit/s, and was intended to be used with their TOPS networking system. A similar solution was the 850 kbit/s DaynaTalk, which used a separate box that plugged in between the computer and a normal LocalTalk/PhoneNet box. Dayna also offered a PC expansion card that ran up to 1.7 Mbit/s when talking to other Dayna PC cards. Several other systems also existed with even higher performance, but these often required special cabling that was incompatible with LocalTalk/PhoneNet, and also required patches to the networking stack that often caused problems. By 1987 Ethernet was clearly winning the standards battle over Token Ring, and in the middle of that year Apple introduced EtherTalk 1.0 for the newly released Macintosh II computer. The package included both a NuBus card with Ethernet ports and a new Network control panel that allowed the user to select which physical connection to use for networking (from "Built-in" or "EtherTalk"). The release's new networking stack also expanded the system to allow a full 255 nodes per LAN. With its release, AppleTalk Personal Network was renamed LocalTalk. Token Ring would eventually be supported with the similar TokenTalk product, which used the same Network control panel and underlying software. Many third party companies would introduce compatible Ethernet and Token Ring cards that used these same drivers. 1987 also marked the introduction of the AppleShare product, a dedicated file server that ran on any Mac with 512 kB of RAM or more. A common AppleShare machine was the Mac Plus with an external SCSI hard drive. AppleShare was the #3 network operating system in the late 1980s, behind Novell NetWare and Microsoft's MS-Net. AppleShare was effectively the replacement for the failed Macintosh Office efforts, which had been based on a dedicated file server device. A significant re-design was released in 1989 as AppleTalk Phase II. In many ways, Phase II can be considered an effort to make the earlier version (never called Phase I) more generic. LANs could now support more than 255 nodes, and zones were no longer associated with physical networks, but were entirely virtual constructs used simply to organize nodes. For instance, one could now make a "Printers" zone that would list all the printers in an organization, or one might want to place that same device in the "2nd Floor" zone to indicate its physical location. Phase II also included changes to the underlying inter-networking protocols to make them less "chatty", which had previously been a serious problem on networks that bridged over wide-area networks. By this point Apple had a wide variety of communications products under development, and many of these were announced along with AppleTalk Phase II. These included updates to EtherTalk and TokenTalk, AppleTalk software and LocalTalk hardware for the IBM PC, EtherTalk for Apple's A/UX operating system allowing it to use LaserPrinters and other network resources, and the Mac X.25 and MacX products. Ethernet had become almost universal by 1990, and it was time to build Ethernet into Macs direct from the factory. However, the physical wiring used by these networks was not yet completely standardized. Apple solved this problem using a single port on the back of the computer into which the user could plug an adaptor for any given cabling system. This FriendlyNet system was based on the industry-standard Attachment Unit Interface or AUI, but deliberately chose a non-standard connector that was smaller and easier to use, which they called "Apple AUI", or AAUI. FriendlyNet was first introduced on the Quadra 700 and Quadra 900 computers, and used across much of the Mac line for some time. As with LocalTalk, a number of 3rd party FriendlyNet adaptors quickly appeared. As 10BASE-T became the de facto cabling system for Ethernet, second-generation Power Macintosh machines added a 10BASE-T port in addition to AAUI. The PowerBook 3400c and lower-end Power Macs also added 10BASE-T. The Power Macintosh 7300/8600/9600 were the final Macs to include AAUI, and 10BASE-T became universal starting with the Power Macintosh G3 and PowerBook G3. In 1988 Apple had released MacTCP, a system that allowed the Mac to support TCP/IP on machines with suitable Ethernet hardware. However, this left many universities with the problem of supporting IP on their many LocalTalk-equipped Macs. Stanford University pioneered development of MacIP, which allowed IP packets to be routed over LocalTalk networks with the support of a suitable "gateway" machine. These were initially custom devices, but it was soon common to include MacIP support in LocalTalk-to-Ethernet bridges. MacTCP would not become a standard part of the Classic Mac OS until 1994, by which time it also supported SNMP and PPP. For some time in the early 1990s, the Mac was a primary client on the rapidly expanding Internet. Among the better known programs in wide use were Fetch, Eudora, eXodus, NewsWatcher and the NCSA packages, especially NCSA Mosaic and its offspring, Netscape Navigator. Additionally, a number of server products appeared that allowed the Mac to host Internet content. Through this period, Macs had about 2 to 3 times as many clients connected to the Internet as any other platform,[third-party source needed] despite the relatively small overall marketshare. As the world quickly moved to IP for both LAN and WAN uses, Apple was faced with maintaining two increasingly outdated code bases on an ever-wider group of machines as well as the introduction of the PowerPC based machines. This led to the Open Transport efforts, which re-implemented both MacTCP and AppleTalk on an entirely new code base adapted from the Unix standard STREAMS. Early versions had problems and did not become stable for some time. By that point, Apple was deep in their ultimately doomed Copland efforts. With the purchase of NeXT and subsequent development of Mac OS X, AppleTalk was strictly a legacy system. Support was added to OS X in order to provide support for the large number of existing AppleTalk devices, notably laser printers and file shares, but alternate connection solutions common in this era, notably USB for printers, limited their demand. As Apple abandoned many of these product categories, and all new systems were based on IP, AppleTalk became less and less common. AppleTalk support was finally removed from the MacOS in Mac OS X v10.6 in 2009. However, the loss of AppleTalk did not reduce the desire for networking solutions that combined its ease-of-use with IP routing. Apple has led development of many such efforts, from the introduction of the AirPort router to the development of the Zero configuration networking system and their implementation of it, Bonjour. The AppleTalk design rigorously followed the OSI model of protocol layering. Unlike most of the early LAN systems, AppleTalk was not built using the archetypal Xerox XNS system. The intended target was not Ethernet, and it did not have 48-bit addresses to route. Nevertheless, many portions of the AppleTalk system have direct analogs in XNS. One key differentiation for AppleTalk was it contained two protocols aimed at making the system completely self-configuring. The AppleTalk address resolution protocol (AARP) allowed AppleTalk hosts to automatically generate their own network addresses, and the Name Binding Protocol (NBP) was a dynamic system for mapping network addresses to user-readable names. Although systems similar to AARP existed in other systems, Banyan VINES for instance, nothing like NBP has existed until recently. Both AARP and NBP had defined ways to allow "controller" devices to override the default mechanisms. The concept was to allow routers to provide the information or "hardwire" the system to known addresses and names. On larger networks where AARP could cause problems as new nodes searched for free addresses, the addition of a router could reduce "chattiness." Together AARP and NBP made AppleTalk an easy-to-use networking system. New machines were added to the network by plugging them and optionally giving them a name. The NBP lists were examined and displayed by a program known as the Chooser which would display a list of machines on the local network, divided into classes such as file-servers and printers. An AppleTalk address was a four-byte quantity. This consisted of a two-byte network number, a one-byte node number, and a one-byte socket number. Of these, only the network number required any configuration, being obtained from a router. Each node dynamically chose its own node number, according to a protocol (originally the LocalTalk Link Access Protocol LLAP and later the AppleTalk Address Resolution Protocol, AARP) which handled contention between different nodes accidentally choosing the same number. For socket numbers, a few well-known numbers were reserved for special purposes specific to the AppleTalk protocol itself. Apart from these, all application-level protocols were expected to use dynamically-assigned socket numbers at both the client and server end. Because of this dynamism, users could not be expected to access services by specifying their address. Instead, all services had names which, being chosen by humans, could be expected to be meaningful to users, and also could be sufficiently long to minimize the chance of conflicts. As NBP names translated to an address, which included a socket number as well as a node number, a name in AppleTalk mapped directly to a service being provided by a machine, which was entirely separate from the name of the machine itself. Thus, services could be moved to a different machine and, so long as they kept the same service name, there was no need for users to do anything different in order to continue accessing the service. And the same machine could host any number of instances of services of the same type, without any network connection conflicts. AARP resolves AppleTalk addresses to link layer, usually MAC, addresses. It is functionally equivalent to ARP. AARP is a fairly simple system. When powered on, an AppleTalk machine broadcasts an AARP probe packet asking for a network address, intending to hear back from controllers such as routers. If no address is provided, one is picked at random from the "base subnet", 0. It then broadcasts another packet saying "I am selecting this address", and then waits to see if anyone else on the network complains. If another machine has that address, it will pick another address, and keep trying until it finds a free one. On a network with many machines it may take several tries before a free address is found, so for performance purposes the successful address is "written down" in NVRAM and used as the default address in the future. This means that in most real-world setups where machines are added a few at a time, only one or two tries are needed before the address effectively become constant. there were no "half-open" connections; once one end initiated a tear-down of the connection, the whole connection would be closed (i.e., ADSP is full-duplex, not dual simplex). The Apple Filing Protocol (AFP), formerly AppleTalk Filing Protocol, is the protocol for communicating with AppleShare file servers. Built on top of AppleTalk Session Protocol (for legacy AFP over DDP) or the Data Stream Interface (for AFP over TCP), it provides services for authenticating users (extensible to different authentication methods including two-way random-number exchange) and for performing operations specific to the Macintosh HFS filesystem. AFP is still in use in macOS, even though most other AppleTalk protocols have been deprecated. ASP was an intermediate protocol, built on top of ATP, which in turn was the foundation of AFP. It provided basic services for requesting responses to arbitrary commands d performing out-of-band status queries. It also allowed the server to send asynchronous attention messages to the client. DDP was the lowest-level data-link-independent transport protocol. It provided a datagram service with no guarantees of delivery. All application-level protocols, including the infrastructure protocols NBP, RTMP and ZIP, were built on top of DDP. AppleTalk's DDP corresponds closely to the Network layer of the Open Systems Interconnection (OSI) communication model. Name Binding Protocol was a dynamic, distributed system for managing AppleTalk names. When a service started up on a machine, it registered a name for itself as chosen by a human administrator. At this point, NBP provided a system for checking that no other machine had already registered the same name. Later, when a client wanted to access that service, it used NBP to query machines to find that service. NBP provided browseability ("what are the names of all the services available?") as well as the ability to find a service with a particular name. Names were human readable, containing spaces, upper and lower case letters, and including support for searching. AEP (AppleTalk Echo Protocol) is a transport layer protocol designed to test the reachability of network nodes. AEP generates packets to be sent to the network node and is identified in the Type field of a packet as an AEP packet. The packet is first passed to the source DDP. After it is identified as an AEP packet, it is forwarded to the node where the packet is examined by the DDP at the destination. After the packet is identified as an AEP packet, the packet is then copied and a field in the packet is altered to create an AEP reply packet, and is then returned to the source node. PAP was the standard way of communicating with PostScript printers. It was built on top of ATP. When a PAP connection was opened, each end sent the other an ATP request which basically meant "send me more data". The client's response to the server was to send a block of PostScript code, while the server could respond with any diagnostic messages that might be generated as a result, after which another "send-more-data" request was sent. This use of ATP provided automatic flow control; each end could only send data to the other end if there was an outstanding ATP request to respond to. PAP also provided for out-of-band status queries, handled by separate ATP transactions. Even while it was busy servicing a print job from one client, a PAP server could continue to respond to status requests from any number of other clients. This allowed other Macintoshes on the LAN that were waiting to print to display status messages indicating that the printer was busy, and what the job was that it was busy with. RTMP was the protocol by which routers kept each other informed about the topology of the network. This was the only part of AppleTalk that required periodic unsolicited broadcasts: every 10 seconds, each router had to send out a list of all the network numbers it knew about and how far away it thought they were. ZIP was the protocol by which AppleTalk network numbers were associated with zone names. A zone was a subdivision of the network that made sense to humans (for example, "Accounting Department"); but while a network number had to be assigned to a topologically-contiguous section of the network, a zone could include several different discontiguous portions of the network. Interior of Apple LocalTalk interface box. In 1989, these boxes typically cost US $90 each. The connectors feature automatic electrical termination of the LocalTalk signal bus; insertion of a LocalTalk bus cable depresses a normally closed switch behind the connector, disabling termination for that connector. The initial default hardware implementation for AppleTalk was a high-speed serial protocol known as LocalTalk that used the Macintosh's built-in RS-422 ports at 230.4 kbit/s. LocalTalk used a splitter box in the RS-422 port to provide an upstream and downstream cable from a single port. The topology was a bus: cables were daisy-chained from each connected machine to the next, up to the maximum of 32 permitted on any LocalTalk segment. The system was slow by today's standards, but at the time the additional cost and complexity of networking on PC machines was such that it was common that Macs were the only networked personal computers in an office. Other larger computers, such as UNIX or VAX workstations, would commonly be networked via Ethernet. Other physical implementations were also available. 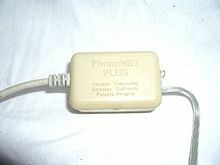 A very popular replacement for LocalTalk was PhoneNet, a 3rd party solution from Farallon Computing, Inc. (renamed Netopia, acquired by Motorola in 2007) that also used the RS-422 port and was indistinguishable from LocalTalk as far as Apple's LocalTalk port drivers were concerned, but ran over the two unused wires in standard four-wire phone cabling. Foreshadowing today's network hubs and switches, Farallon provided solutions for PhoneNet to be used in "star" as well as bus configurations, with both "passive" star connections (with the phone wires simply bridged to each other at a central point), and "active" star with "PhoneNet Star Controller" hub hardware. Apple's LocalTalk connectors didn't have a locking feature, so connectors could easily come loose, and the bus configuration resulted in any loose connector bringing down the whole network, and being hard to track down. PhoneNet RJ-11 connectors, on the other hand, snapped into place, and in a star configuration any wiring issue only affected one device, and problems were easy to pinpoint. PhoneNet's low cost, flexibility, and easy troubleshooting resulted in it being the dominant choice for Mac networks into the early 1990s. AppleTalk protocols also came to run over Ethernet (first coaxial and then twisted pair) and Token Ring physical layers, labeled by Apple as EtherTalk and TokenTalk, respectively. EtherTalk gradually became the dominant implementation method for AppleTalk as Ethernet became generally popular in the PC industry throughout the 1990s. Besides AppleTalk and TCP/IP, any Ethernet network could also simultaneously carry other protocols such as DECnet and IPX. When AppleTalk was first introduced, the dominant office computing platform was the PC compatible running MS-DOS. Apple introduced the AppleTalk PC Card in early 1987, allowing PCs to join AppleTalk networks and print to LaserWriter printers. A year later AppleShare PC was released, allowing PCs to access AppleShare file servers. The "TOPS Teleconnector" MS-DOS networking system over AppleTalk system enabled MS-DOS PCs to communicate over AppleTalk network hardware; it comprised an AppleTalk interface card for the PC and a suite of networking software allowing such functions as file, drive and printer sharing. As well as allowing the construction of a PC-only AppleTalk network, it allowed communication between PCs and Macs with TOPS software installed. (Macs without TOPS installed could use the same network but only to communicate with other Apple machines.) The Mac TOPS software did not match the quality of Apple's own either in ease of use or in robustness and freedom from crashes, but the DOS software was relatively simple to use in DOS terms, and was robust. The BSD and Linux operating systems support AppleTalk through an open source project called Netatalk, which implements the complete protocol suite and allows them to both act as native file or print servers for Macintosh computers, and print to LocalTalk printers over the network. The Windows Server operating systems supported AppleTalk starting with Windows NT and ending after Windows Server 2003. Miramar included AppleTalk in its PC MacLAN product which was discontinued by CA in 2007. GroupLogic continues to bundle its AppleTalk protocol with its ExtremeZ-IP server software for Macintosh-Windows integration which supports Windows 2008 Server and Windows Vista as well prior versions. HELIOS Software GmbH offers a proprietary implementation of the AppleTalk protocol stack, as part of their HELIOS UB2 server. This is essentially a File and Print Server suite that runs on a whole range of different platforms. In addition, Columbia University released the Columbia AppleTalk Package (CAP) which implemented the protocol suite for various Unix flavors including Ultrix, SunOS, *BSD and IRIX. This package is no longer actively maintained. Netatalk is a free, open-source implementation of the AppleTalk suite of protocols. ^ AppleBus is mentioned by name in Steve Jobs' introduction of the Macintosh at the Boston Computer Society meeting in 1984. It appears just after the 7:20 mark in the video. ^ Oppenheimer 2004, Slide 3. ^ a b c Sidhu, Andrews & Oppenheimer 1989, p. xxiii. ^ a b c d Bartimo 1984, p. 45. ^ Oppenheimer 2004, Slide 6. ^ Oppenheimer 2004, Slide 9. ^ Oppenheimer 2004, Slide 10. ^ Oppenheimer 2004, Slide 15. ^ Oppenheimer 2004, Slide 19. ^ Oppenheimer 2004, Slide 17. ^ "Apple Computer Ad - Powerbook Networking"
^ Oppenheimer 2004, Slide 28. ^ Oppenheimer 2004, Slide 30. ^ Oppenheimer 2004, Slide 31. ^ Oppenheimer 2004, Slide 32. ^ Laura DiDio, "Study finds NetWare to be OS of choice", Network World, 11 July 1988, p. 17. ^ Oppenheimer 2004, Slide 34. ^ a b Oppenheimer 2004, Slide 36. ^ Oppenheimer 2004, Slide 43. ^ Calore, Michael. "April 22, 1993: Mosaic Browser Lights Up Web With Color, Creativity". WIRED. Retrieved 14 October 2017. ^ Oppenheimer 2004, Slide 46. ^ Oppenheimer 2004, Slide 51. ^ Oppenheimer 2004, Slide 54. ^ "Mac OS X v10.6: Mac 101 – Printing". Retrieved on 2 September 2009. ^ Sidhu, Andrews & Oppenheimer 1989. Sidhu, Gursharan; Andrews, Richard; Oppenheimer, Alan (1989). Inside AppleTalk, Second Edition (PDF). Addison-Wesley. ISBN 0-201-55021-0. Bartimo, Jim (26 March 1984). "Apple, waiting for IBM net, links micros with AppleBus". InfoWorld: 45. Oppenheimer, Alan (January 2004). "A History of Macintosh Networking". MacWorld Expo. Archived from the original on 16 October 2006. This page was last edited on 16 March 2019, at 22:21 (UTC).